2012.04.27 MonoTracer Training in Tuggen, Switzerland. Last month on Friday, April 27th MonoTracer of Switzerland held the first of four scheduled training days for the 2012 year. The training was held at a dedicated motor vehicle training facility in Tuggen, Switzerland about 30 miles south of Zurich. The MonoTracer training classes are limited to 8 students with at least 4 available instructors and begins with 1 hour of classroom theory explaining the physics and dynamics of piloting a MonoTracer. 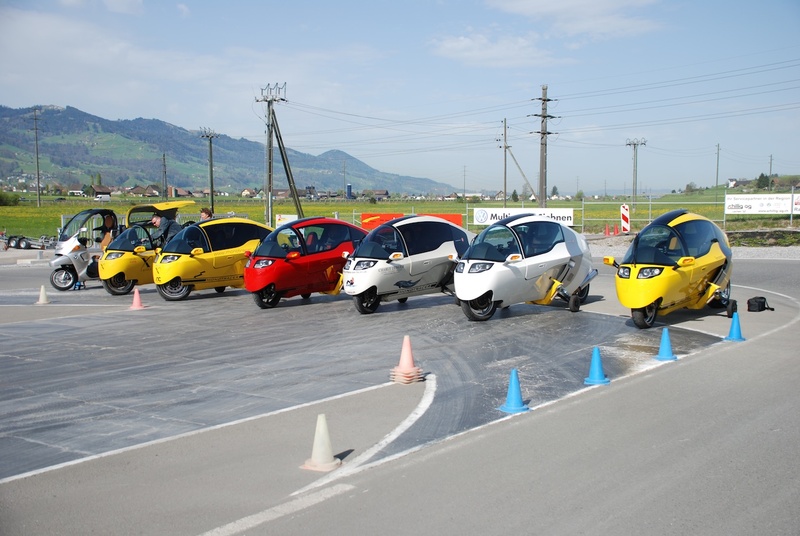 At least 4 training MonoTracers (2 gas-powered and 2 electric-powered) are provided along with a BMW C1 which is used to verify the student understands the all important concept of countersteering prior to transitioning to the MonoTracer. The training MonoTracers are all outfitted with temporary yellow training axles to protect the vehicle from falling over beyond 20 degrees. 1. Safe slow speed handling of the cabin motorcycle. 2. Safe operation of the bionic legs (aka outriggers or stabilizers). 3. Safe braking with the integral ABS system. 4. Theories of countersteering for non-believers. 5. Technical class for vehicle maintenance. The focus is on “the Upper Half of the Motorcycle” and it is highly recommended one read/study Bernt Spiegel’s Motorcycling bible The Upper Half of the Motorcycle: On the Unity of Rider and Machine . Expect lots of turning-your-head-before-the-vehicle-turns, ride-where-you-look-and-not-look-where-you-ride, think-far-ahead-and-look-far-ahead, don’t-brake-with-your-jaws-and-your-teeth-but-with-the-brake-pedals/levers, and of course, don’t-forget-to-breath. Oh, and there may even be a little yoga and a little ZEN… 😉 At a minimum you’ll leave the training with a better appreciation and knowledge of motorcycle riding. Enjoy the video below by Mediafusion of the April 27th, 2012 MonoTracer Training in Tuggen, Switzerland. Are you an experienced motorcyclist or a pilot? Are you thinking about buying a MonoTracer? Then take the chance to have a close look at our high performance cabin motorcycle. It’ll be the most awesome experience of your life. Arrive the evening before or first thing in the morning. Start at 8:30am sharp. Cost: EUR 200,– plus hotel, food & lodging. Four instructors will show you how to ride a MonoTracer. Your first lesson will be in an all-electric MTE-150. After you’ve made some progress, we’ll show you how to ride and shift the BMW powered MTI-1200. Interested? You must have a full motorcycle licence and ideally, plenty of experience of riding heavy and powerful motorcycles. Individual driver training is available every Monday by appointment only in Winterthur, Switzerland for EUR 500 per day. This entry was posted in Peraves and tagged Bernt Spiegel, bionic legs, MonoTracer Riding School, MonoTracer Training Days, MTe-150, MTi-1200, outriggers, stabilizers, Switzerland, The Upper Half of the Motorcycle: On the Unity of Rider and Machine, Tuggen. Bookmark the permalink.